My first impression of Imperium is that it doesn’t do anything that hasn’t already been done in one form or another, which on first glance is a little disappointing. However, it is never a good idea to judge a book by its cover and the already been done fact somewhat pales into insignificance after using the modification for a few minutes. After installation, Imperium produces a user information alert on the SpringBoard, advising that it can be configured via the native iOS Settings application. The settings panel is native in appearance, utilizing standard and familiar user interface controls as well as labeling each settings option for maximum clarity. One of the biggest issues I have had in the past with Cydia-based installations is that they come with comprehensive configurable options and the developer never elaborates what each setting does and usually names it something totally obscure. Thankfully, Imperium doesn’t suffer from this issue. Considering the Imperium tweak has three individual homescreens when activated, it seems to make sense to break it down into having three sets of core functionality – multitasking, system settings and application launching. When invoked through the chosen gesture, the first homescreen gives access to the device’s backgrounded apps. For those that aren’t familiar, backgrounded applications are those that have been closed down but still sit in the ‘switcher tray’. 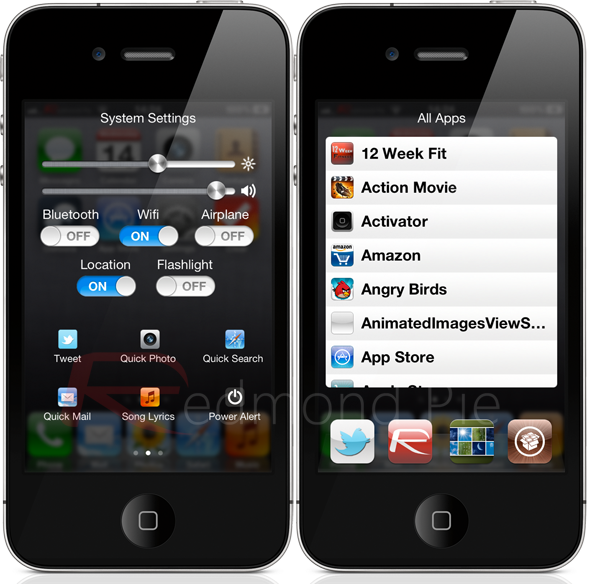 The apps are arranged in rows of three and provide the option to delete each application from the background. Nothing exceptional going on here, just the switcher tray re-imagined. The second homescreen is where the system settings magic happens, along with a few other additional options. The system settings which can be adjusted or toggled include screen brightness, volume, Bluetooth, Wi-Fi, Airplane Mode, Location Services and Flashlight. Users also have the ability to invoke a Tweet Sheet using the saved Twitter accounts, open up the Camera app, perform a web-based search, compose an e-mail, get access to the power settings and search for lyrics for the currently playing iPod song. As mentioned at the start of the post, nothing which hasn’t already been done in the past exists, but the layout and aesthetics of Imperium make it one of the best implementations of these options that I have seen to date. The third and final homescreen is purely dedicated to the device’s installed applications and includes both Cydia and App Store installations. The main portion of the screen is dedicated to a scrollable list of installed apps that can be tapped and launched immediately. The bottom horizontal ‘dock’ at the bottom of the third view displays four icons which are configurable through the Settings panel. When I talk about the settings options, it allows users to configure favorite applications as well as control the blur radius, animation speed and background intensity, the fact that it contains a substantial feature set as well as being professionally implemented, it’s difficult to not speak highly of Imperium. In a future update I would like to see the ability to toggle the tweak on or off through Settings and also the addition of a button on the first homescreen to immediately kill all applications from the background, hopefully that will included as the tweak goes forward. 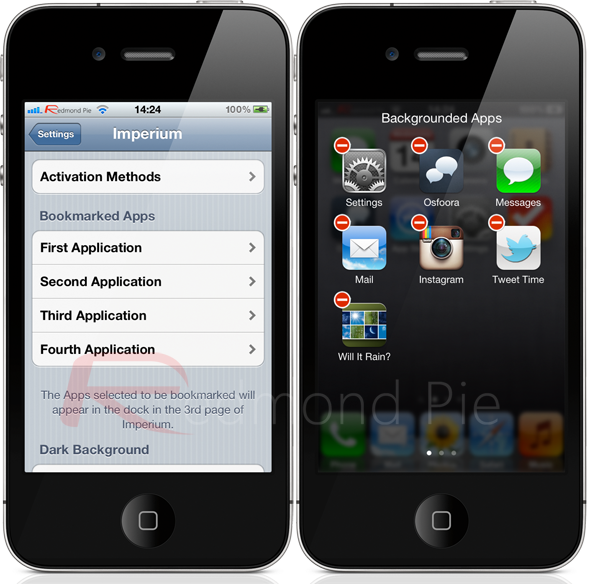 Imperium is set to hit the BigBoss repository in the next few days and will cost $0.99 so keep an eye out. Users will need to be running iOS 5 or above on an iPhone or iPod touch.